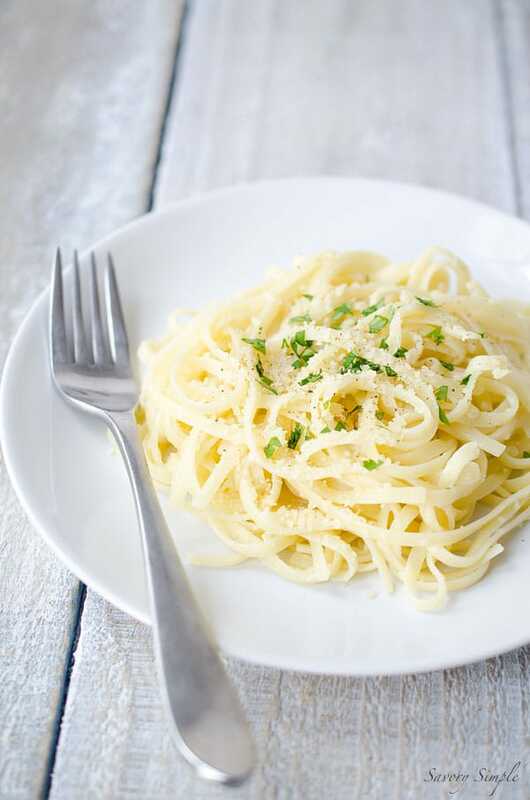 This Lemon Garlic Parmesan Pasta is a super easy dinner that’s ready in under 20 minutes! It’s one of my favorite last minute meals since I always have the ingredients on hand. 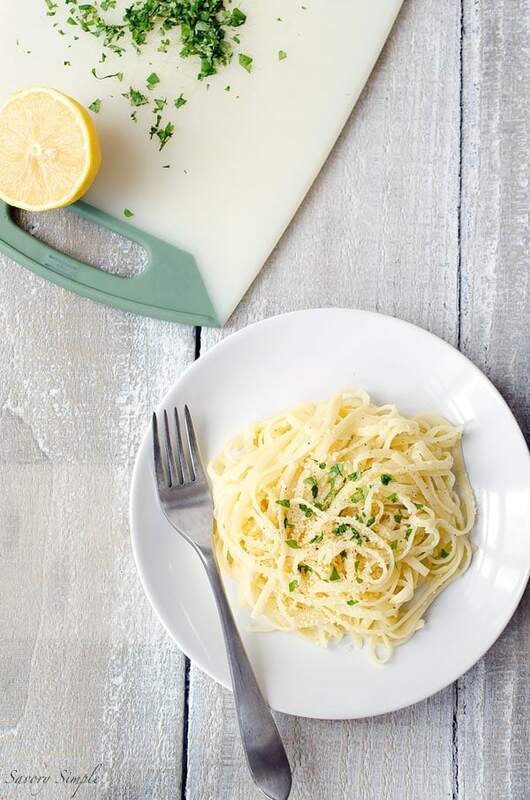 It seriously doesn’t get any easier than this lemon garlic parmesan pasta. Right now that’s what I’m craving – simple comfort food that’s ready in minutes. What can I say, the holidays wore me out. I don’t really buy into the January health craze. This is what I need right now. Lemon, garlic and parmesan are like the holy trinity of comfort food. These three ingredients create a perfect harmony of flavors. 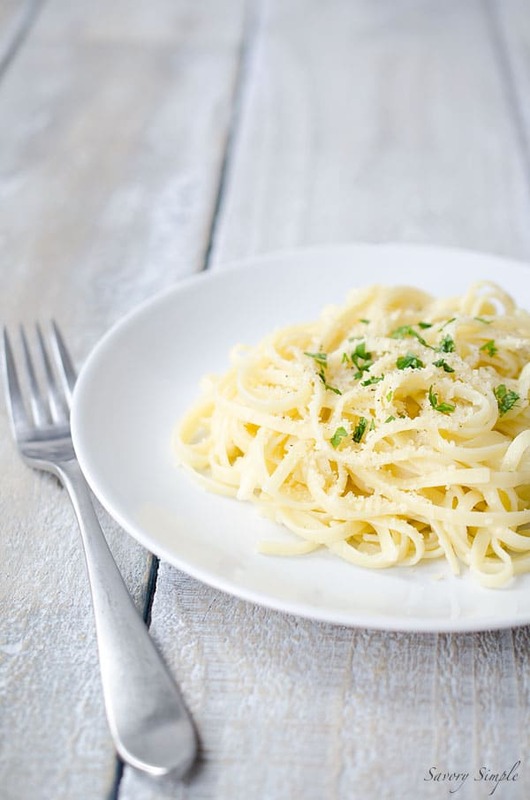 This cheesy lemon garlic pasta can be on the table in less than 20 minutes. What more can you ask for? Try serving it with a light white wine (I personally love New Zealand sauvignon blanc). You really want to use higher quality ingredients since the recipe is so basic. Freshly grated Parmigiano-Reggiano is worlds better than pre-grated parmesan cheese sold in the green tube. Also, I strongly recommend grating it with a microplane zester or the finest setting on your box grater. This way it melts into the pasta in the best possible way. You’ll never achieve the taste of freshly minced garlic if you try substituting garlic powder (even jarred minced garlic can have a strange aftertaste that you won’t want to chance adding to your dish). You always want to use fresh squeezed lemon juice for this type of recipe. Always. Don’t use those squeeze bottles! Pasta water is a magic trick with recipes such as this one. If you don’t use it (or are too sparing), you’ll find the final dish too dry and gummy. Adding hot pasta water helps bring the ingredients together for a perfectly blended dish. Love pasta? Be sure to check out my Cheesy Spinach & Artichoke Pasta, Pasta with Cashew Truffle Cream Sauce, and Spaghetti with Parmesan, Pine Nuts and Brown Butter Sauce! 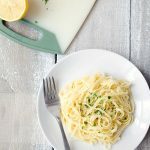 This Lemon Garlic Parmesan Pasta is a super easy dinner that's ready in under 20 minutes! Prepare the linguine according to package instructions, using well salted water. Before draining, reserve 1 cup of the pasta water and set aside. While the pasta is cooking, heat the olive oil over medium low heat in a small pan. Add the minced garlic and cook for 1-2 minutes until fragrant. Remove from the heat. In a large bowl, toss together the pasta, olive oil and garlic, lemon juice, parmesan cheese, black pepper, and 1/4 cup of the pasta water. Add additional pasta water as needed until the ingredients are easy to stir. Taste; add additional black pepper and salt, if needed. (Note: parmesan cheese is salty, so you might not need any). Divide into portions and top each serving with extra parmesan cheese and, if using, chopped parsley. This is a simple dish that begs for high quality ingredients. For best results, use freshly grated Parmigiano-Reggiano cheese, fresh squeezed lemon juice and a good quality olive oil. You'll be able to taste the difference! I love serving this dish with white wine (my preference is sauvignon blanc). I strongly recommend grating the cheese on either a microplane zester (my first choice) or the finest setting on a box grater. This way it just melts into the pasta in the best possible way. Did anyone have problems with the parmesan clumping together in the pot? Any suggestions would be helpful. I have made it twice with the same results. Try adding some more pasta water. Also, are you using pre-grated parmesan cheese? That could also be contributing to the issue since some brands have a lot of filler ingredients that aren’t even cheese: corn starch, etc. That could cause clumping. I recommend grating the cheese fresh or at least purchasing it from a cheese counter. No, I bought a block from Costco and grated it myself. I did add more pasta water but didn’t use the full 1/2 cup. Will try that next time. Going to use parmagian cheese that I have which is Romano and parmagian. I don’t think by using the one in the recipe would be any different from the one I’m using! It’s still gonna taste the same no matter what cheese I use! You want to taste all the ingredients blended together not just the cheese so I don’t really think it makes a difference. Just a few simple, quality ingredients and the results look outstanding! Perfect meal with the craziness going on in my house now! If I could eat pasta, I would gobble these up! This is totally my kind of pasta…..so simple! Love the light and fresh flavor with this pasta dish!